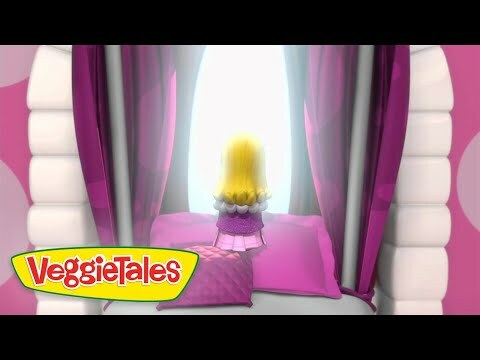 Princess Poppyseed’s life on her family’s farm is far from the glamorous world of her favorite pop singer Vanna Banana. While Princess milks the cows and dreams of a life on stage, Vanna has her own dreams of a life far from the hectic pace of stardom that leaves her feeling alone and lonely. On a chance meeting at a playground, Vanna and Princess cross paths and realize that they look almost exactly alike—which leads to the crazy notion that maybe they could switch lives! In a flash, the girls’ secret plan is launched, and Princess is whisked to her new life as a pop star while Vanna gets to live her dream of life away from the pressure of fame! As Princess tries to live up to the demands of being a diva and Vanna learns how to milk the cows, things don’t go as smoothly as they would like! As each girl realizes that the life they longed for doesn’t fulfill all of their dreams, they realize that the life God gave them is the one for which they were uniquely and lovingly designed. Features the new song "You Never Are" from Dove Award winning Female Vocalist of the Year, Francesca Battistelli. Princess Poppyseed's Points for Being Uniquely You! Behind the Music with Francesca Battistelli, Mike Nawrocki, and friends!